The lavender is blooming in my garden. Last week I decided to use some to make a herb bundle to burn when cleansing my circle before spells and rituals. But I am in a bit of a quandary as to whether I should have done so or not. 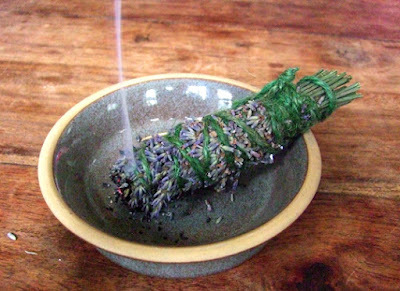 You see, the act of ritually using the smoke from burning herb bundles - "smudging" - is controversial. As most witches are aware, smudging is a ceremony used by some indigenous people in America. It involves burning tied bundles of sacred herbs for spiritual cleansings or blessings. The details of the ceremonies and the specific herbs used vary from tribe to tribe. However, it is often considered taboo for those outside those particular traditions to attempt to perform the ceremonies or borrow elements from them. The problem is that loads of modern pagans and followers of new age paths have been copying elements of the practise without the necessary permission. That can be considered cultural appropriation. Tied herb bundles or "smudge sticks" are sold all over the place. They usually contain white sage. That is the most well known herb used in traditional Native American smudging ceremonies, but there are others. I admit I have used white sage myself in the past. That's something I feel guilty about and I have decided I won't buy any white sage smudge sticks ever again, out of ethical considerations. So, why did I decide to make my own herb bundle? Well, mainly it was out of curiosity from a crafting point of view. I'd long wanted to try out the technique of making one, just to see if I could. 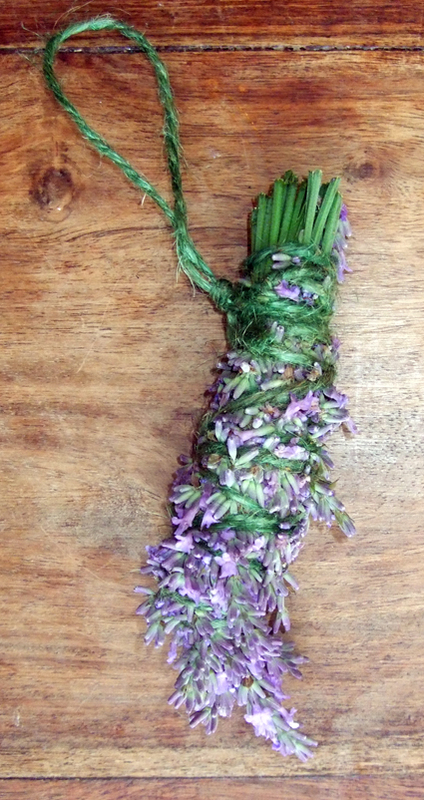 Having now made a tied herb bundle, I can confirm it works. But, I might not do it ever again as I really don't want to offend anyone. That isn't to say I won't harvest my lavender and use it to ritually cleanse my circle. I've been doing that for years, but I've usually collected the seeds then burned them on charcoal, often as part of an incense blend. 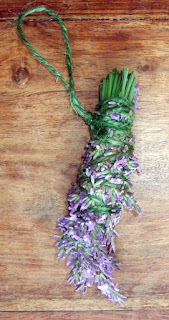 That method is part of European traditions for ritual cleansing and is a bit different from tying the flowering heads up in twine, drying the bound bundle for several days and then burning that to create a purifying smoke. I don't have any specific ethical problems over using lavender. It is not a taboo Native American herb - it grows naturally in Europe and has been used there for all sorts of cleansing purposes since ancient times. White sage doesn't grow naturally in England and there are environmental as well as ethical issues associated with importing it. 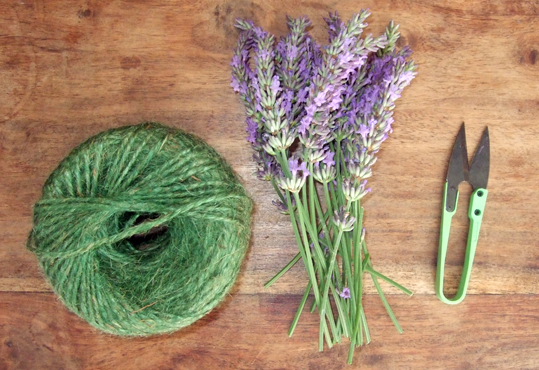 There are some other things in my defence for making a tied lavender herb bundle too. I won't be making loads and selling them. I won't be making any false claims about them and I won't be pretending to be an initiate of any Native American tradition. I'm just a bad British witch using the herbs in my own garden for my own purposes. Nevertheless, I still don't feel very comfortable about what I did. Was it too close to taboo Native American traditions? I'm curious to learn about different techniques for suffumigation, but I don't want to piss anyone off. 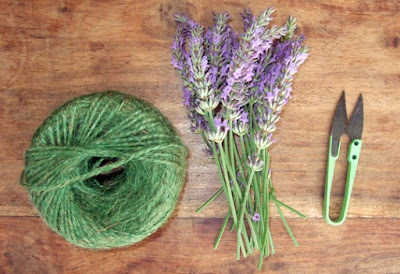 The photos on this page show various stages involved in the making of my lavender dried herb bundle. My gut feeling is that your practice of smudging is ok because it is private. Cultural appropriation can be thought of as "person from culture X hands in a project and gets graded with an F. Person from culture Y copies person X's project, and receives an A*". Appreciation is private. Appropriation is public. Could be wrong of course. Who can say if the ancient people of Europe practiced this or not, also with a lot of scientists now thinking that early Euopeans got to North America around the same time as those from Asia , who can say where the practice may have started. The burning of herbs is a common practice among many cultures and the practice of drying herbs by hanging tied bundles is found everywhere. However it is the use of specific Native American herbs which to me is more of the issue White Sage is used in the pagan/new age scene as a panacea often for uses it wouldnt be used for. When I teach people to use herbs, however I encourage them to seek ones that are local to them and try to understand and work with the herbs energies. Generally in the UK pharmacopeia Mugwort fits the picture of a spiritual cleanser and gateway to the realms. But it is often blended with other herbs such as lavender, rosemary,wormward etc depending on the work to be undertaken and the taste of the user.. So is burning of bundles of herbs exclusivisly Native American no, it can be found in most culture especially where there is a. Shamanic practice, did our ancestors burn herbs in this way almost certainly, maybe not the tightly bundle form sold in every new age shop but certainly bundled herbs left drying in the window of a cottage. However the use of herbs from other culture without understanding or a spiritual exchange of energy if not morally wrong, certainly magically inferior to herbs gathered from your own environment that you have grow nurtured and bonded with. I agree about the white sage which is alien to us here. But I also no longer advocate the bundling into tight sticks prior to burning. Our British traditions suggest burning herbs loose in a chafing dish or as fronds. People from all parts of the world have been using smoke for purification for 1000's of years. It's not exclusive to Native Americans. Smudge away with impunity my darling! I don’t know the answer; but I do know that in Canada, native Americans sell smudge sticks, along with braids of sweet grass. I rather thought that these were for burning not for hanging up and looking at - is it appropriation to buy something from someone and use it? Thanks for the thought-provoking comments everyone! Why call it smudging? You're just burning plants/resins, a very ancient practice in probably every single part of the world. Don't use white sage, it's been over harvested, and call it censing.